Fun Installation on a Friday! This morning, Dan and Olivia completed an installation for a client down at The Wharf. In their kitchen/lounge area, we installed a custom, laser cut & powder-coated map of the Southwest Waterfront neighborhood. 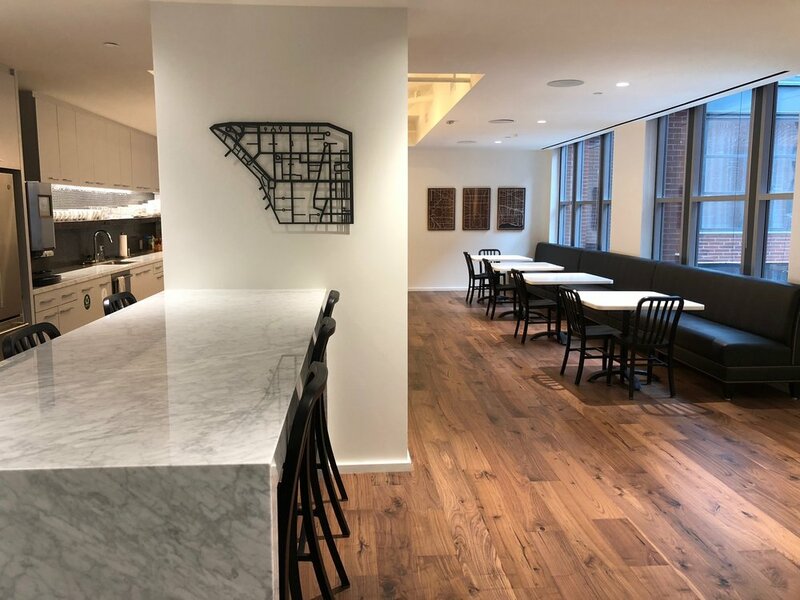 The sculpture, which Olivia designed in-house, stands about an inch off of the wall so that the shadows create an interesting reflection on the wall and on the marble counter-top below. Further back in the dining area, Olivia sourced 3 wood & resin maps. Not only do they visually tie the room together with the wooden floors, but they also have a direct relationship to the firm’s work. The client is a bipartisan lobbying firm, so the maps depict the street grids surrounding Capitol Hill, the White House area, and the Navy Yard. Last but not least, we placed a large panoramic photograph of the Tidal Basin in the Potomac Conference Room for… well, obvious reasons! We are absolutely loving all of the activity at The Wharf these days. This client is lucky enough to be right in the thick of it. Looking forward to more projects in that area!